To all math teachers, mathematicians, and math enthusiasts who are also Facebook users, it is now possible to use Latex on Facebook. All you have to do is to use Google Chrome as a browser and install the Latex for Facebook Extension. Until Facebook integrates latex into its system, I think this one is very good to use. So far so good, I have no complains about it. 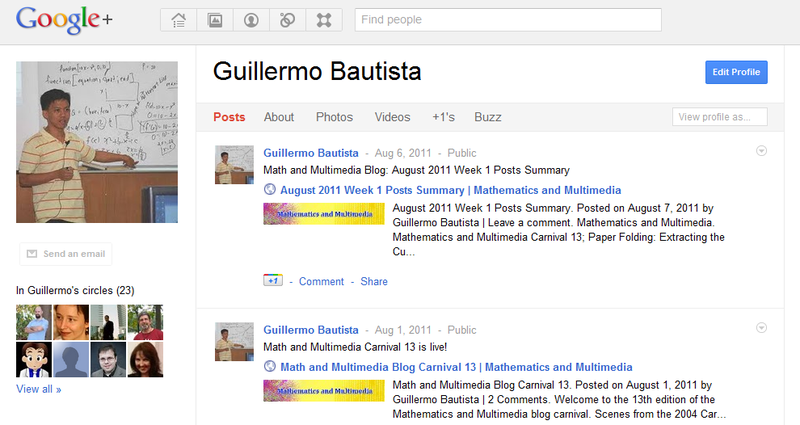 The things I like most about Google+ is that you can choose “circles” who can view your wall posts. You can share intimate thoughts with friends, and have professional conversations with colleagues without one group reading the message for the other. This is not the case in Facebook yet.